"What do you mean, 'It's made of ice and breathes fire'? That doesn't make any sense!" "Maybe it's vulnerable to heat and cold?" "Uh, somehow, I don't think that's how it works . . ."
Dungeon Fantasy is all about killing things and taking their stuff. But no loot worth having sits unguarded, and high-minded (or greedy) adventurers often make killing monsters its own goal, whether because the Things are evil and need killin', or just because their teeth and horns make exceptional daggers. Of course, for all this to work, you need monsters – lots of monsters! That's where Dungeon Fantasy Monsters 1 comes in. 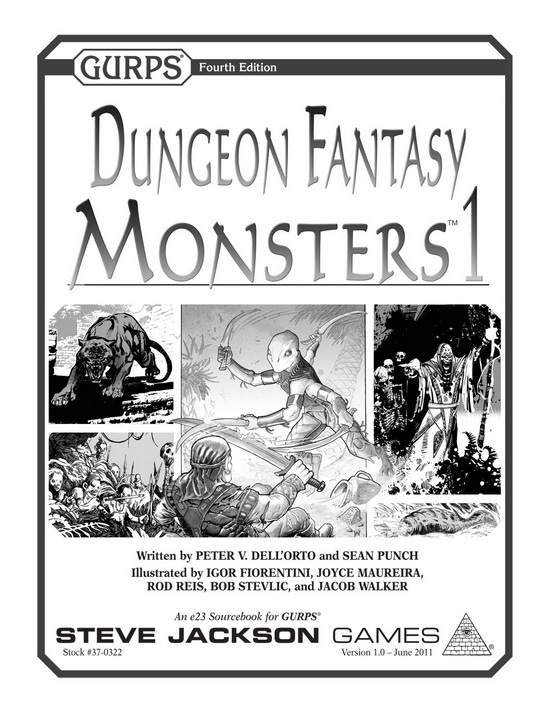 While many Dungeon Fantasy books include a few monsters, this supplement is the first in a series dedicated to just the monsters! Inside are 30 creatures to challenge dungeon delvers of all skill levels, ranging from pesky leeches and pygmies to deadly liches and Elder Things. Each comes with complete stats and plenty of notes about habitats, tactics, treasures, and how to GM the abilities of particularly powerful (or weird) critters. Since players can read this book, there's also one other touch: A chapter on how to change familiar monsters. Because there are undead slimes, and then there are undead undead slimes . . . and nobody expects the fire elemental ice wyrm (or the cold elemental flame lord). Get ready to kill some thieves test the mettle of your noble adventurers! For two new monstrous prefixes to make your own monsters more terrible, check out Pyramid #3/76: Dungeon Fantasy IV. Looking for a guide to rating monsters for how dangerous they'll be to the heroes? Then check out Pyramid #3/77: Combat! 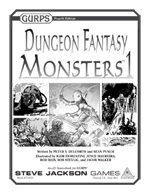 Two more monster prefixes can be found in Pyramid #3/80: Fantasy Threats, alongside six more monsters in the vein of GURPS Dungeon Fantasy 14: Psi . . . plus other great material for fantasy heroes!